An overweight Labrador and his owner have shed 7st (44kg) between them, to land the pet an animal charity's slimming champ of the year title. Lucky lost a quarter of his body weight in six months, and helped owner Alyson King, 49, from Pontypridd, lose 5st (32kg) as she too went on a diet. Ms King said: "Now he runs and jumps around, which he wasn't able to do before." 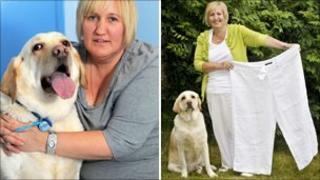 The PDSA is warning that up to half of UK pets will be obese by 2013. Lucky came top in the slimming stakes after losing 5in (13cm) from his waistline, and his weight fell by about 2st (13kg). Ms King said that before his diet, Lucky had struggled to walk properly and hated all forms of exercise. She said: "As the weight has dropped off, he's become much more energetic. "He certainly keeps me in check - if he thinks it's time for walkies, he starts whining at me so I don't forget. "It's been a real weight-loss journey for both of us." Without his "no treats" diets and the extra exercise, the nine-year-old is unlikely have survived much longer, according to PDSA vets, who drew up a food and fitness regime for him. The animal charity said it has found that more than one-in-three of the almost 25,000 dogs it had weighed across the UK in the past four years was overweight. It found one in four cats also tipped the scales too far over the same period. It said that about 50% of people's pets will be obese by 2013, if that trend continues. Angela Heeley, senior vet at Cardiff PDSA PetAid hospital, said: "Obesity is a growing problem amongst UK pets."